Picking the perfect venue for your wedding or other special event can be a difficult decision to make. Lucky for you, we have made finding a beautiful venue with helpful, friendly staff a breeze. Check out some of our favorite places below! Photo courtesy of Wild Wren Photography. The Bluff View Art District is one of our favorite wedding venues in Chattanooga. From the picturesque views, gorgeous landscape, and beautiful architecture to their intimate, first class dining accomodations and lodging, this place is truly one of a kind! Contact their event coordinator Jordan Hayes for more details! Photo courtesy of Bamber Photography. This unique space, located on the Southside in Chattanooga, TN, is the perfect venue for just about any event. The Granfalloon is a space which boasts large, open floor plans and has a ton of personality! With their eclectic style, vibrant colors, and rustic industrial accents, The Granfalloon is a hip wedding venue for all you modern couples. Photo courtesy of Alycia Edgeman Photography. This space is one of the most popular venues in the Chattanooga, TN area. It has a warm, rustic charm with exposed brick and beams, historical architecture, original staircase, and hardwood flooring throughout. If you're looking for a large space that is easily adaptable to suit your vision, this is your space. Photo courtesy of Fowler Studios. Ramble Creek is an 8,000 suare foot venue of pure awesome! This beautiful gem is located in Athens, TN (between Chattanooga and Knoxville). Both the venue architecture and surrounding landscape are stunning! If you're not convinced after seeing their photos, perhaps this will help you decide: Ramble Creek is the winner of the Wedding Wire Couples' Choice Award for 2017! Get in touch with Ramble Creek by phone, or check out their website for additional details. Photo courtesy of Lora Lynch Photography. 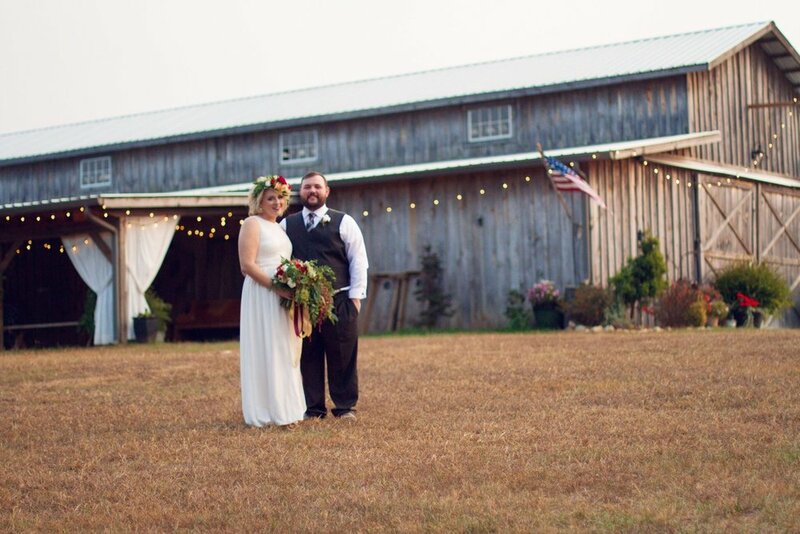 The Barn at Drewia Hill is a charming wedding venue located in Sale Creek, TN (about 30 minutes north of Chattanooga). We love the rolling landscapes, magical lighting, and most of all, we love the ease of designing this venue to help make our couples' dream weddings a reality. For pricing and booking information, contact Kris Cobb. Photo courtesy of Kyle Branum Photography. The Homestead at Cloudland Station is located in Chickamauga, GA. This venue boasts an Amish farmhouse built in 1871, an Italianate farmhouse, a carriage house, and a large formal green. It's nice to have options when crafting your perfect day, and there will soon be even more with the addition of their herb garden and fruit and vegetable stand. Check out their new website, and be sure to get in touch with Angie Lyle to book this great space! Photo courtesy of Our Ampersand Photography. Fox & Fern loves Debarge Vineyard and Winery! This venue is located in North Georgia, so it's practically right in our back yard! The rolling hills and wine tastings are enough to make us want to go back, but the fantastic staff make experiences here memorable for all involved. (Psst...They also have an Urban Wine Tasting Room on Chattanooga's Southside, and we highly recommend checking it out.) Get in touch with them today to find out what all the fuss is about! Photo courtesy of Christan C. George Photography. There's no place quite like The Urban Lawn. Located on Chattanooga's Southside, it's the perfect marriage (pun absolutely intended) of the big city and the great outdoors. We adore this unique wedding and event venue. It is a space with style and class where you can relax. Get in touch with them today to book your wedding or event! The Bell Mill Mansion is a Greek Revival estate sitting on 32 acres of land in Ooltewah, TN. With its resort-style gradeure and impressive list of ammenities, this is one you'll have to see to believe. Click on over to their website to see what we're talking about. The Gray Dove is an exceptional, Southern farm venue in Ooltewah, TN. This venue is a working hobby farm, so you may see many animals out and about, but not to worry--they're all tucked away at night. The landscape is breathtaking, with large trees lining the property. The barn itself is warm and inviting, with lovely bistro lighting. This charming space is convenient to the city of Chattanooga while still managing to be a place where you can enjoy your big day in peaceful tranquility.